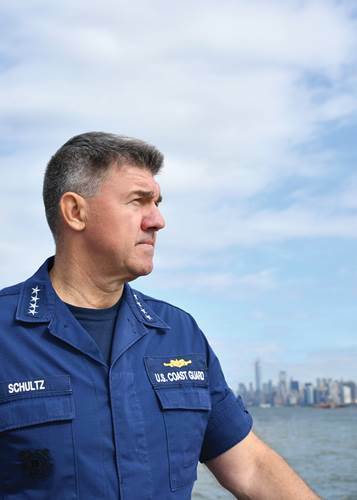 Coast Guard Commandant Adm. Karl Schultz visits with Coast Guard crews stationed in New York City. U.S. Coast Guard photo illustration by Petty Officer 1st Class Jetta Disco. MarineLink has a wide ranging interview with the Commandant dated 4 Dec., 2018. The interview is from a Marine Industry prospective, so the flavor is a bit different from what we see from Defense oriented interviewers, more about the prevention side, still a lot of interest in the Polar Security Cutter program. Perhaps the most informative section concerns cyber and what the Coast Guard is doing about cyber threats.